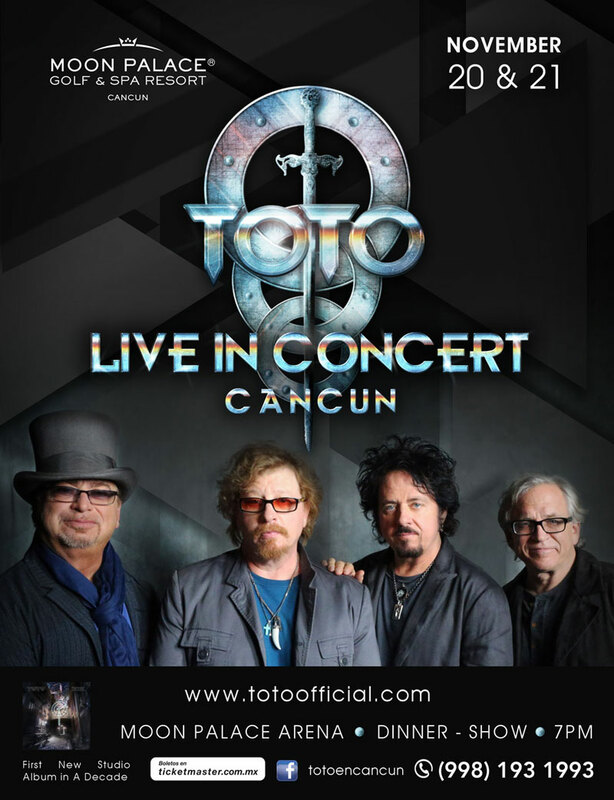 Toto, has been one of the top-selling tour and recording acts for the past 38 years. The renowned Rock group has released 17 albums and sold more than 35 million copies. Individual band members can be heard on over 5,000 albums, totaling half a billion in sales, and have also received 225 Grammy nominations combined. Top hits include “Africa,” “Rosanna,” “Hold the Line,” “Stop Loving You,” and “I’ll Be Over You.” In 2009, Toto was inducted into the Musicians Hall of Fame and Museum located in Nashville, Tennessee, a feat that has added to their significant repertoire of musical accomplishments. Concert goers will enjoy a pre-show dinner at 7 p.m. before the performance begins at 9 p.m. The show will take place at the Moon Palace Arena, a 140,000 square foot convention center that opened in 2014. The Arena has already hosted multiple events including performances by Grammy-winning Rock bands Chicago and Kansas, as well as the fourth annual Cancun-Riviera Maya Wine & Food Festival’s Tasting Village and other noteworthy affairs. Moon Palace Golf & Spa Resort, a AAA Four Diamond property, is located on Cancun’s tranquil South shore and nestled between 123 acres of tropical foliage and secluded white sand beach. The property continues offering guests an unforgettable vacation experience with world-class hospitality and top entertainment. Moon Palace Golf & Spa Resort recently underwent a $100 million dollar enhancement project which included upgrades and renovations to the restaurants, guest rooms, lobbies and more. The hotel offers guests more than 2,400 waterside and garden view accommodations or golf villa suites. Multiple pools are complemented by two children’s pools, one Golf Club pool, six whirlpools and four swim-up bars. Additionally, guests who book a stay of five nights or more are privy to the most valuable vacation promotion on record – $1,500 Resort Credit, which can be used on spa and beauty salon treatments, golf outings, romantic dinners, wedding packages and off-site excursions and tours. Palace Resorts’ all-inclusive accommodations start at $172 per person, per night, based on double occupancy. To reserve your Palace Resorts stay, please visit www.PalaceResorts.com, call (800) 635-1836 or contact your preferred travel professional. *Entertainment promotion excludes Isla Mujeres Palace & Cozumel Palace. *Prices range from $89-$229 for guests who wish to purchase additional tickets.